When is 'Hot Dog Season'? Memorial Day to Labor Day is Hot Dog Season, when more than 800 hot dogs per second are consumed in the U.S. That's about 7 billion hot dogs for the season. Overall, 88% of hot dog eaters use mustard as a topping (2012). • Los Angeles - Mayonnaise, Cheese. 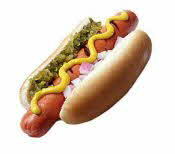 Hot dogs or frankfurters, are usually said to have originated in Frankfurt-am-Main, Germany around 1484. Some claim it originated in Coburg, Germany and was created by butcher Johann Georghehner in the 1600, and Vienna also claims to be the origin. George J. French introduced his French's mustard in 1904, the same year that the hot dog was introduced to America at the St. Louis World's Fair. Nathan Handwerker started his own Coney Island boardwalk business in 1916 ('Nathan's') to sell hot dogs for a nickel. Reportedly this was on the advice of a singing waiter and his piano player, Eddie Cantor and Jimmy Durante. The hot dog on a bun Americans are most familiar with, also has more than one story as to where it was first served. The most common story is that they were originally sold from pushcarts on the streets of New York City during the 1860s. They were a hit wrapped in paper at the 1886 Colombian Exposition in Chicago and in 1904 at the St. Louis Louisiana Purchase Exposition where they were probably first served in a bun (still called frankfurters). What we do know for sure is that they were popularized as "red hots" in New York by Harry M. Stevens, a vendor at the Polo Grounds (some say Yankee Stadium). And T.A. Dorgan, a cartoonist named them when he drew one as a dachshund on an elongated bun around 1906 and called it a "hot dog." President Franklin D. Roosevelt served hot dogs to King George VI of England during his 1939 visit to the United States. In 2009 the world record for eating hot dogs was 68 Nathan's hot dogs and buns in 10 minutes Joey Chestnut.